Sound and visual designer Gary James Joynes crafts unique multi-sensory exhibitions. There’s a lot of ingenuity involved in getting a crowd to stare at a giant pile of sand through the wee hours of the night. But that’s exactly what sound and visual designer Gary James Joynes managed to accomplish last September at Nuit Blanche Edmonton, where he showcased his “Ouroboros” installation at City Hall. On top of the sand was yet more sand, this time in the form of a video beamed from a ceiling-mounted projector. The big difference, though, was that the sand in the video shifted from one abstract pattern to another in response to changes in high-frequency sounds that Joynes recorded, looped and masked by ambient vocals. The result was a three-dimensional presentation that held 17,000 patrons – who came and went through the night – in rapt fascination. “You know what made me really proud that night in this hockey city? That’s actually more than what you would get at an Oilers game!” Joynes says. 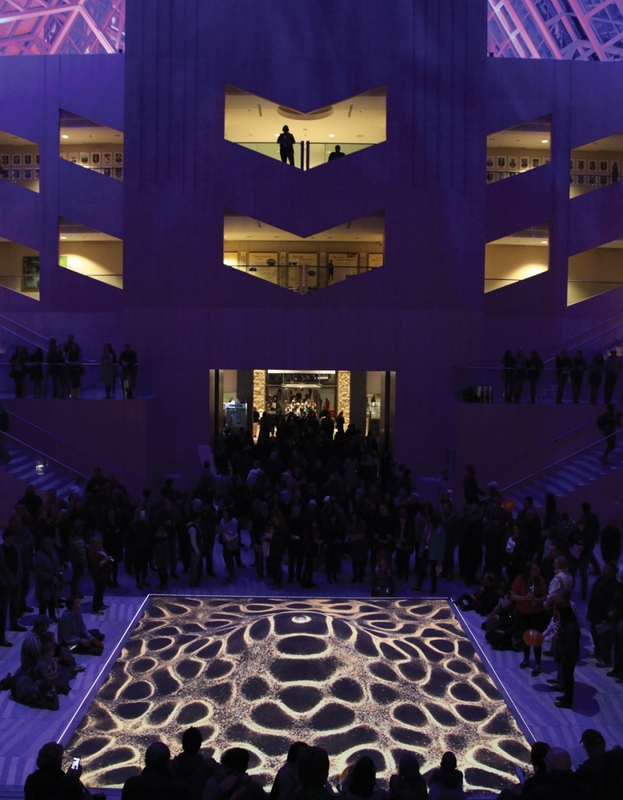 Nuit Blanche was undoubtedly Edmonton’s largest exposure to the local artist. But Joynes – who for years has been honing his craft of creating “frequency paintings” by blasting sound waves through powerful speakers underneath metal plates to manipulate the movement of sand on those surfaces – has long enjoyed international acclaim for his work. Wall-mounts of these granular formations, representing anything from tapestries to religious symbols, hang in galleries across Canada and worldwide, while his live shows have enjoyed centre-stage status at Montreal’s high-tech MUTEK audio-visual festival and similar electronic gatherings in Vancouver, New York, Boulder, Colo. and Detroit. He toiled for years as a bassist and lead singer in obscure metal and progressive rock bands, but when the umpteenth ensemble broke up in 1998, Joynes – who was already exposed to electronic works by Icelandic singer Bjrk and musical innovator Brian Eno – bought an old analog synthesizer and started tinkering with it. He eventually gained a national following with his synth-based compositions under the moniker Clinker, which he still performs under today. But in 2009, when he saw a film called Cymatics: Bringing Matter to Life With Sound, which explored the visual properties of sound waves. Joynes found another art form with which to experiment. Almost a decade of dogged experimentation and several blown speakers later, Joynes enjoys big crowds at his installations and exhibitions at local galleries. He’s currently preparing for a festival in Montana later this year and an international feature museum show in Mexico City in 2017. While Joynes hasn’t had much time to soak up the success, he does admit he has to pinch himself at times.